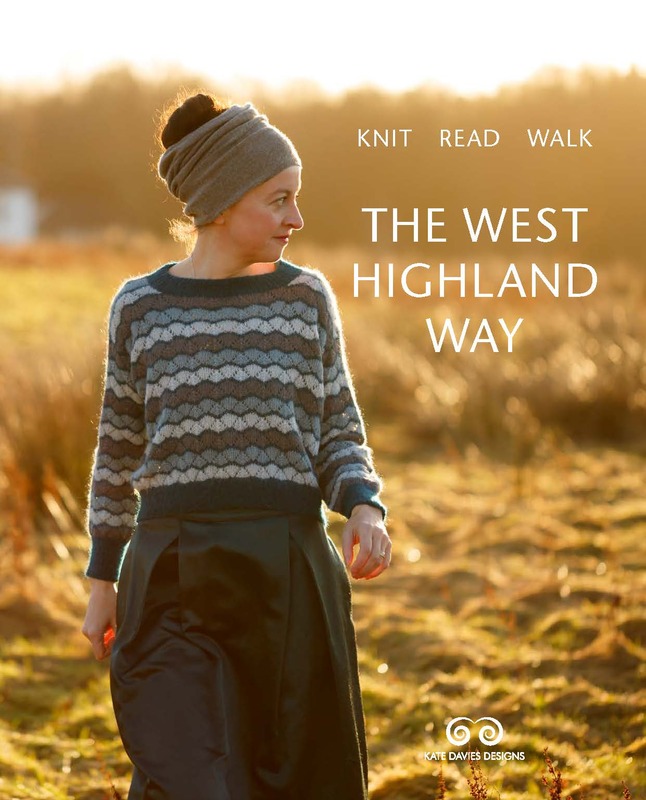 Some days I wake up and I feel massively, incredibly lucky to have somehow landed here, in this curious new life, as a designer of hand-knits. Last Thursday was one of those days. Because I had been invited — along with Debbie Bliss , Jane Ellison, Claire Montgomerie, and Emma Varnam — to visit Gawthorpe Textiles Collection. Gawthorpe Hall. Left to right Emma Varnam, Claire Montgomerie, Jennie Pitceathly and Debbie Bliss. Originally built for Lancashire’s prominent Shuttleworth family in the early 1600s, with a Victorian redesign by Charles Barry and Augustus Pugin, Gawthorpe Hall itself is extremely impressive. But the building wasn’t what we had come to see. 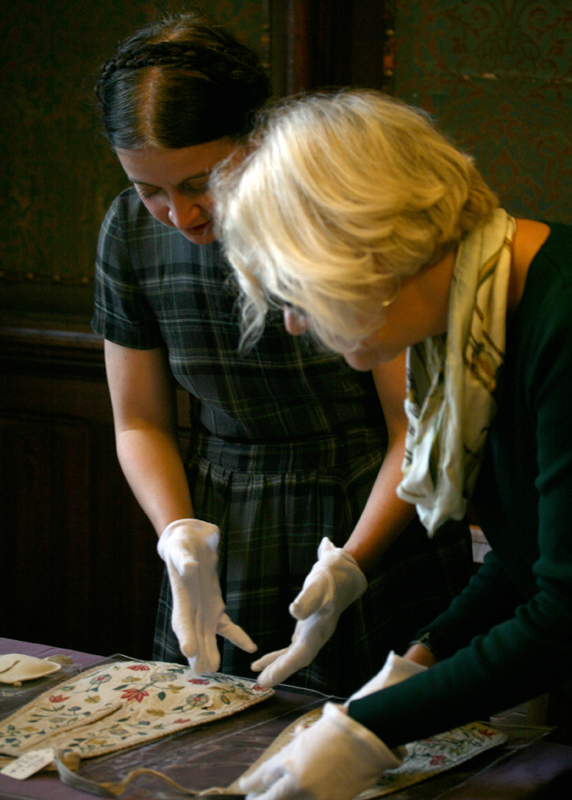 Gawthorpe is home to an important textile collection, ammassed by Rachel Kay Shuttleworth. Born in 1886, and heavily influenced by the Arts and Crafts Movement, Rachel Kay Shuttleworth used her means and her position to gather textiles from all over the world, and to disseminate information about the traditions and skills that were involved in their production. By the age of 26, she had gathered over 1000 items, and began organising, cataloguing, and sharing her collection with interested visitors. 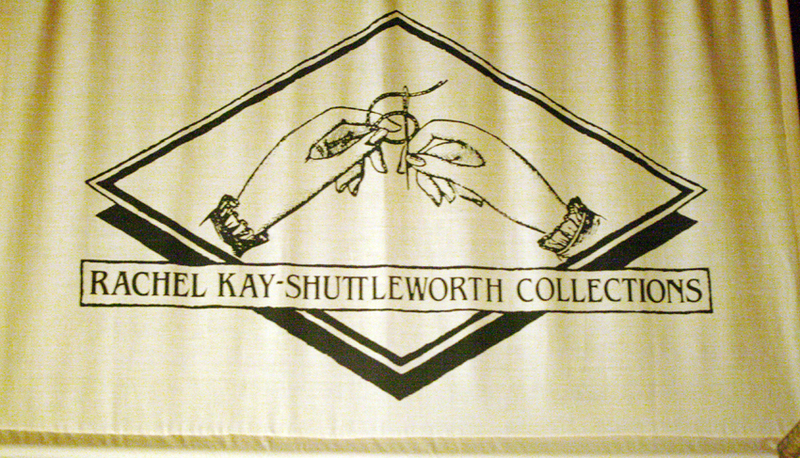 Today the collection that Rachel Kay Shuttleworth began over a century ago now comprises more than 30,000 amazing textiles, showcasing a diverse array of needle crafts from elaborately embroidered Chinese Emperor’s robes, to Mechlin Laces; from Bolivian chullos to Indian shawls; from embroidered maps to soldier’s quilts. We designers had been invited to take part in an exciting project. We’d been commissioned by Gawthorpe (with funding from the Arts Council) to produce an accessory inspired by an item (or items) from Rachel Kay Shuttleworth’s collection. We began the day with a tour of the part of the collection that’s on public display. I particularly liked the display of Rachel Kay Shuttleworth’s desk and work boxes, complete with blotting paper, original haberdashery and notions, and projects in various states of completion. You could imagine her having just left the room, to take a break from her lace work. One of the most appealing things about this collection is the way that the hand and mind of its creator is so apparent in it. 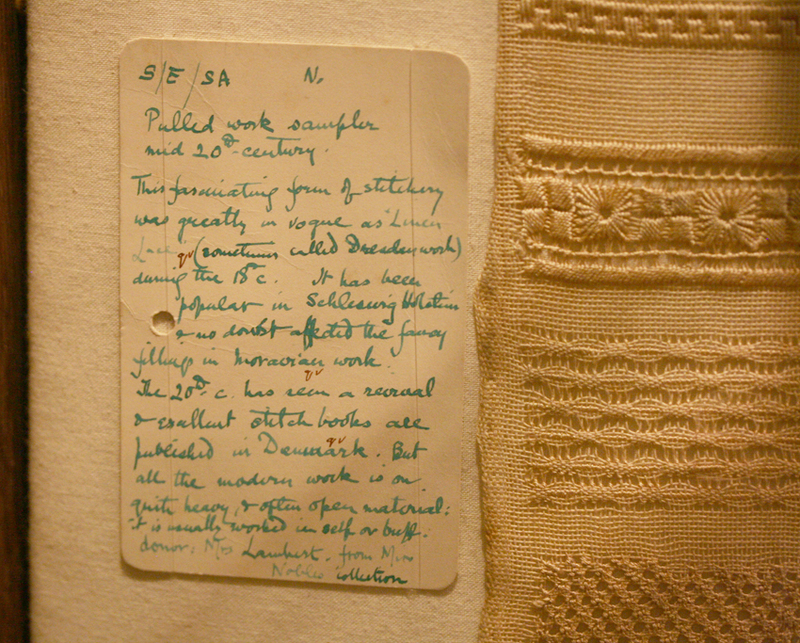 Reading Rachel Kay Shuttleworth’s annotations and catalogue cards give a great sense of the extent of her vast knowledge about textiles and textile history . . .
. . . as well as a flavour of her personality through her idiosyncratic – and strongly held – views. Rachel Kay Shuttleworth was also an incredibly skilled needlewoman herself, and the collection includes many examples of her work. I was particularly taken with this beautiful crewel work bedspread that she embroidered for herself. Begun in 1905, work on this bedspread and its accompanying accessories took Rachel thirteen years. She completed the project with a palm-tree flourish on Armistice day 1918. After tea and cake (cake!) we adjourned to the library where Rachel Terry, the collection’s curator, had gathered an incredible range of objects for us to examine and be inspired by. 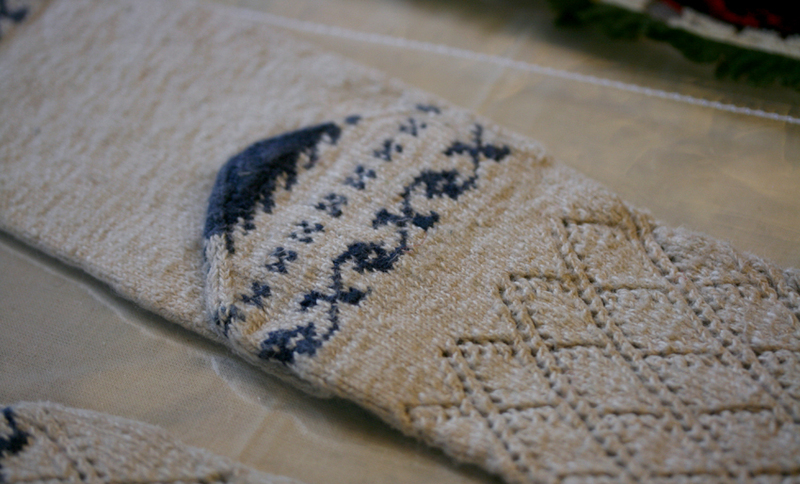 There were beautiful and intriguing knitted items . . .
. . . and work involving other media and skills. One of the real highlights of the day for me was getting to examine some eighteenth-century pockets – of which the collection has several examples. You know I dearly love a pocket. Here, Debbie and I . . .
. . are checking out these beauties . 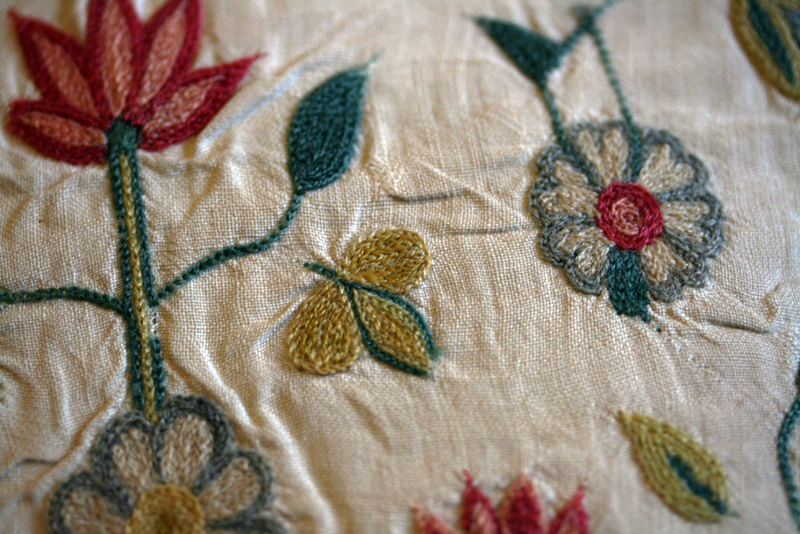 . .
. . .which date from the early eighteenth century and whose neat chain-stitch is still beautifully fresh and bright. Here, Rachel is showing us a tiny pocket . . .
. . . which had been fashioned for an infant. And I was gobsmacked by the detail of the beautiful corded quilting on this pocket . . .
. . . which had clearly been cut from an earlier garment. The fabric was certainly too glorious to waste! 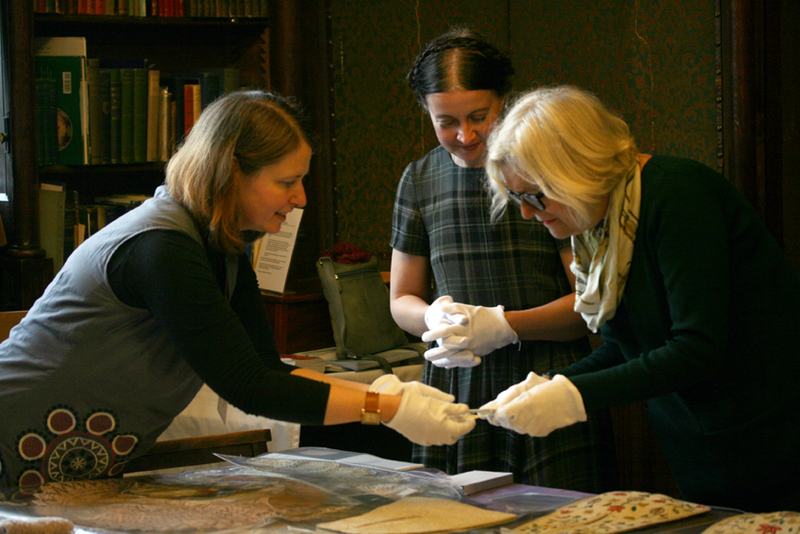 Can you think of anything better than hanging out in a library with great company, getting to examine beautiful historic textiles, and being able to learn about those textiles from their curators? Well, I certainly can’t. It was an amazing day. Now Debbie, Jane, Claire, Emma and I have to go away and have a think about the design we intend to create. The idea is that we all produce patterns for our designs, which will be available as part of a kit from Gawthorpe this coming Spring. I will keep you updated as to my progress with the project as time goes on. I also imagine it may be hard to keep me away from Gawthorpe . . . I definitely intend to be back. I was deeply impressed by the collections at Gawthorpe, which really are superb, and are a definite must-see if you have a chance to visit this lovely part of Pennine Lancashire. It was also fantastic to spend time with my comrade-designers, all of whom were tremendous fun and none of whom I’d met before. But more than this, I was blown away by the dedication, knowledge and generosity of Jennie Pitceathly, Rachel Terry and their small team at Gawthorpe. “I have a vision,” wrote Rachel Kay Shuttleworth in 1912, “of a place of meeting where neighbours will come for many reasons to seek stimulating thought by meeting other active minds, to find refreshment and inspiration and a joy in beauty”. This truly is what Jennie and Rachel are creating at Gawthorpe, and I feel honoured to be involved. 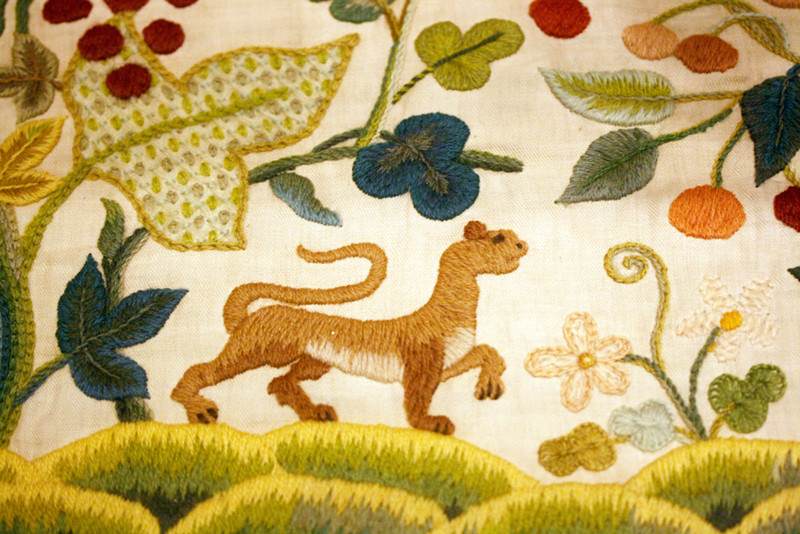 Gawthorpe Hall – including the Rachel Kay Shuttleworth Textile Collection – is open to the public 12 noon-5pm, Wednesday – Sunday until 3 November 2013. 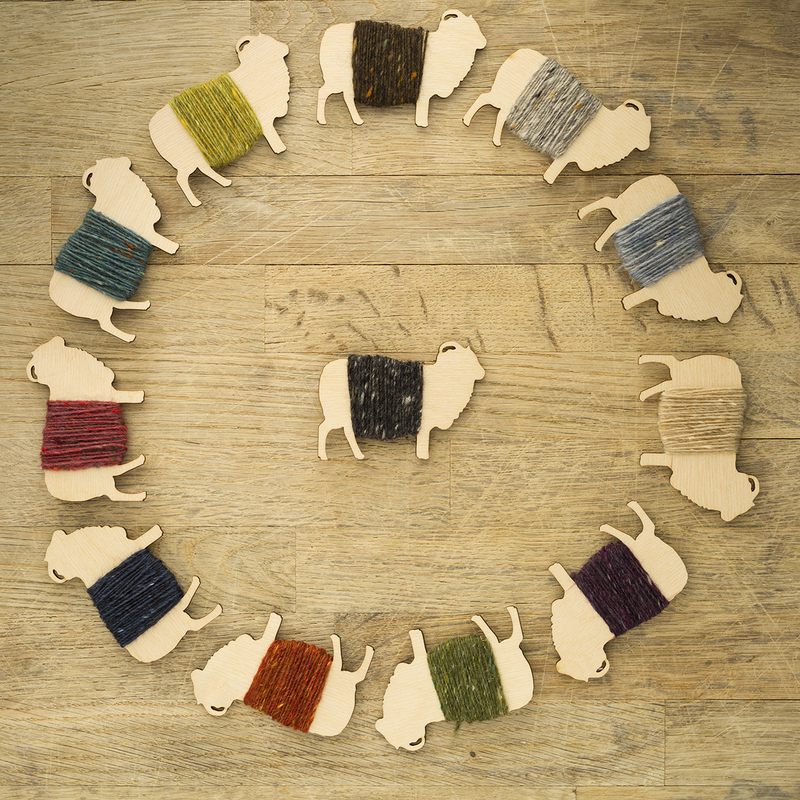 The hall will re-open in the Spring of 2014, when our patterns and kits inspired by the collection will go on sale! All images in this post are reproduced courtesy of Gawthorpe Textile Collection, and are not to be reproduced without permission. 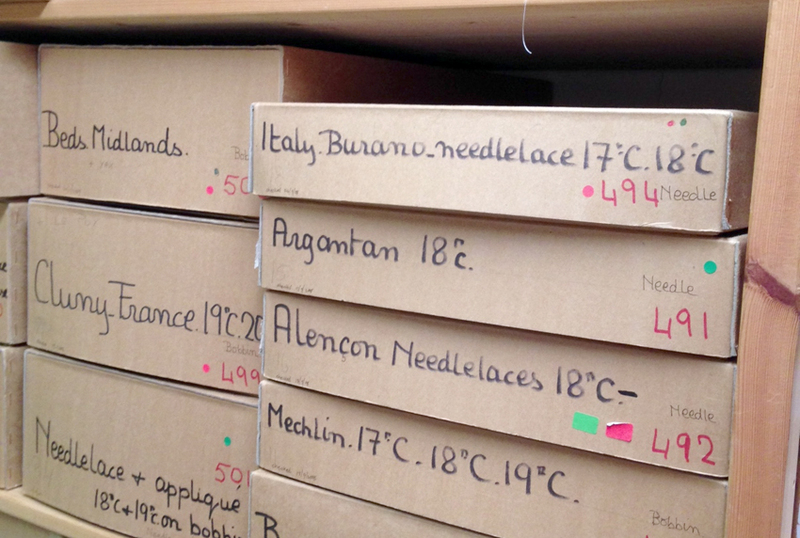 How interesting that we all have niches among the extensive textiles collected by Rachel Kay Shuttlesworth. I was there a couple of years ago with a tour for quilt historians, and we were treated to a wonderful spread of quilts and tops, shown in a large workroom above the former stables. Nary a bit of embroidery, save that on the quilts, was introduced. We did learn that Rachel’s collection was dismissively called “Rachel’s Tat” during her collecting days, and that she did not puechase a single piece – it was all donated by like-minded individuals. The visit remains one of my fondest of England. Thank you for sharing this wonderful experience. I am looking foward to visit the place next year and see /buy the new designs. what an honour! I can’t wait to see what you *(and the others) design! Kate . 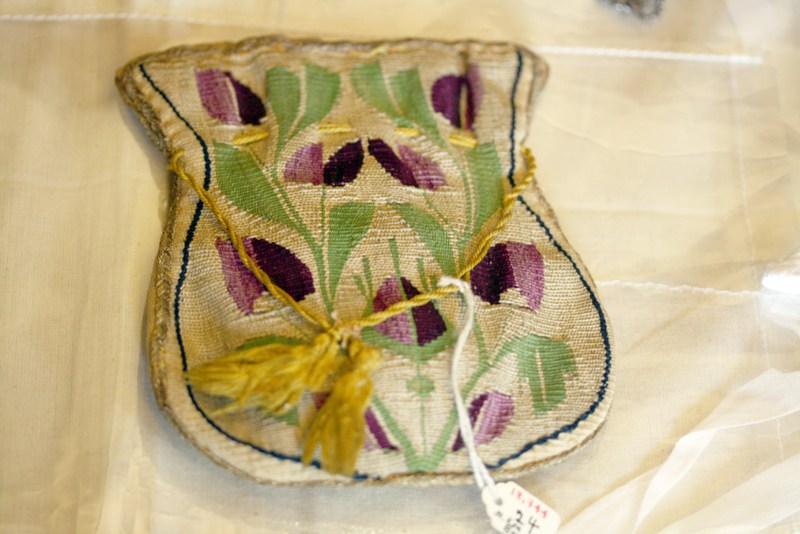 . . Do you know what technique was used for the, I think its a drawstring bag, 10th picture down, light colored background, maroon tulips with green leaves, yellow drawstring? Is it woven? Its lovely. Thank you for sharing this special occassion with us and making it a potential stop off when visiting. Yes, pockets should come back into style . . . they look so useful. Wow. Just, wow. I think this place just made it onto my bucket list! So much incredible – lucky you to have it so nearby! Absolutely stunning – what a thrill it must have been to see this gorgeous collection. I envy you the history – New Zealand is very much a ‘young’ country and as such we miss out, not just the architecture, but the crafts and skills which are so evident here. what a wonderful post, I enjoyed it so much then last evening on the television I was watching “At Home with the Georgians” with Amanda Vickery and she also showed pockets, She discussed how extremely personal they were, how they were worn and used. I would love to spend a week with both of you. Loved the photos and detailed describtions. Lovely written post with lovely photos.. There are many embroidered pockets, costume and domestic textiles at the DeWitt Wallace Decorative Arts Museum in Williamsburg, Virginia.. I have seen the work of someone who makes miniature pockets and mounts them in antique frames with other tiny garments. 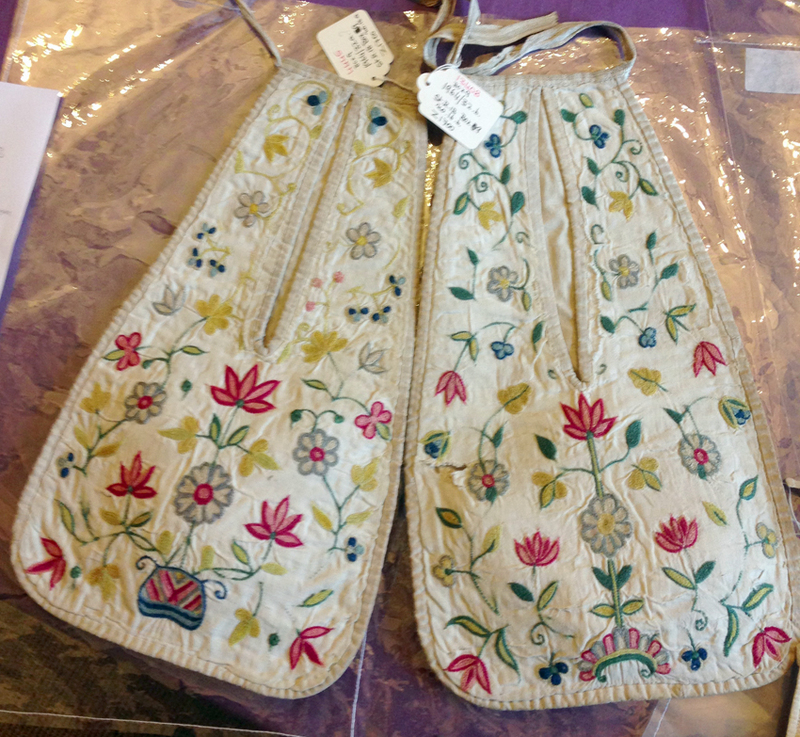 And then the dress aprons…embroidered silk, white work and the plain silk ones worn over busily printed dresses in the mid 19th century. Makes you wonder what still lingers in attics today. Happy designing! What an incredible experience! Thank you so much for sharing. I cannot wait to see what you come up with! Thank you, Kate, for taking us along on this visit to Gawthorpe. I am totally in awe of the work. O wow, what an amazing opportunity for you! The venue looks very beautiful indeed, not to mention the textile collection! Thanks for sharing them with us. Best of luck with creating a design inspired of this collection! I am astonished- to think that I lived in Whitworth which is just a few miles away and never knew it was there. I’ll just have to go as its is surely one of the best collections of its kind. Many thanks for making me more informed. This is fantastic. I’m in awe of all these beautiful works of art. Thank you so much for showing them to us! I’m looking forward to see the design you’ll come up with. Twenty years ago, I had a behind-the-scenes textiles tour at the Plymouth (Massachusetts) Antiquarian Society, featuring similar historical treasures. It made me feel connected to and deeply respectful towards the needlewomen of centuries past. I have not forgotten that day, and don’t imagine that I will — pockets and all. What a lovely place, and what a great project-in-the-making this is! It sounds like a wonderful day, and I appreciate your sharing it with us. I can’t wait to see the results of this inspiration from all the designers. It will be fascinating! I loved reading your post this morning and would dearly like to go there one day, I have always wanted to go but feel the need even more so now. Many thanks for sharing your wonderful outing here. Oh my oh my! How inspiring! and exciting and exotic and glamorous! I can’t stop looking at the glorious blue and white sock detail! and the lace work in progress, and her desk! It all has such a breath of days long gone. Thank you for sharing Kate. What a wonderful day and your post is so interesting, so much to look at, think about and research. Surely something to encourage the mind to be active. I look forward to seeing the results of this project. What a day! I used to visit Gawthorpe often, and remember scrutinising the samplers that hung in the corridors, and being amazed by how young the Victorian embroideresses were (younger than me at 12 or so, wandering around and imagining the Brontes coming to visit). 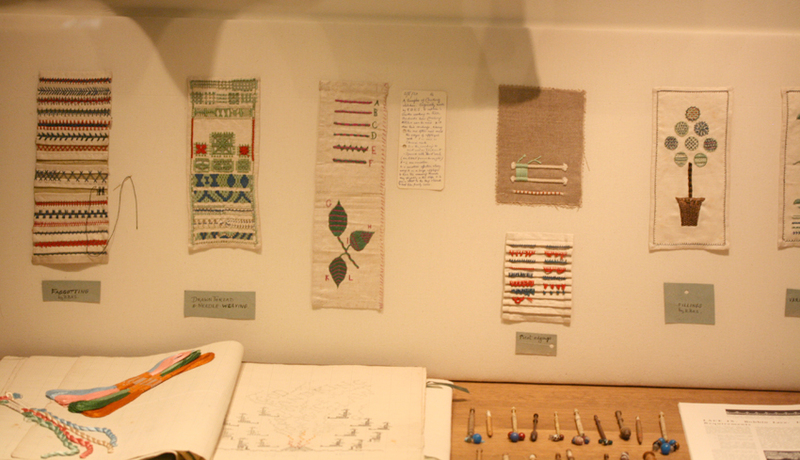 I remember rag-rugging projects run for school-age crafters – I do still have the rug – and roaming through the gardens, and the long gallery, and the stonework… but I think it may have been before the expansion of the textile display itself. I must add it to my grown-up ‘go back and visit’ list. Thank you. How fortunate you and your fellow designers are to have been able to see this glorious collection. I’m sure Ms. Shuttleworth is smiling from somewhere at your interest and upcoming projects inspired by her collections. Oh! I am so envious! I recently cleared out a cupboard belonging to our Handknitters’ Guild and found an extraordinary treasure trove of early patterns – but no textiles. I can only imagine what people must have made. What an amazing day!! Can’t wait to see what you come up with. That is such a fabulous legacy for one woman to leave, especially given the time Rachel was amassing the collection. And she started so young!! Wouldn’t it have been wonderful to meet her……oh for a time machine! I grew up less than a mile from there! The grounds of the hall and the immediately surrounding countryside are very familiar territory as I explored there so much as a teenager. Yet I’ve never got round to seeing the textile exhibition- the few times I’ve been inside that part was closed as, if I remember rightly, they used to only open the textiles collection for visitors in summer. One day I will get in to see it! I’m very jealous of your day there. It seems that Rachel Kay Shuttleworth’s vision is indeed being realized. I’m looking forward to the results of such inspiration. By some cosmic coincidence I have been re-reading Gaskell novels recently, and the biographies and critical discussions published with them as well, so that Shuttlesworths and Kay Shuttlesworths are both fresh in mind. And now Gawthorpe is on my “someday when I can return to Britain” list, so thank you for that, and for the pictures of such exemplary handwork. And of course for the reference to “misspent energy”! Dear Kate, you are a treasure. Thank you so much. Absolutely inspiring. I love this post. How exciting. The detail on some of those items is just amazing and I can’t wait to see what you all design. What an amazing coincidence! I’m booked to go on a study visit there this week. 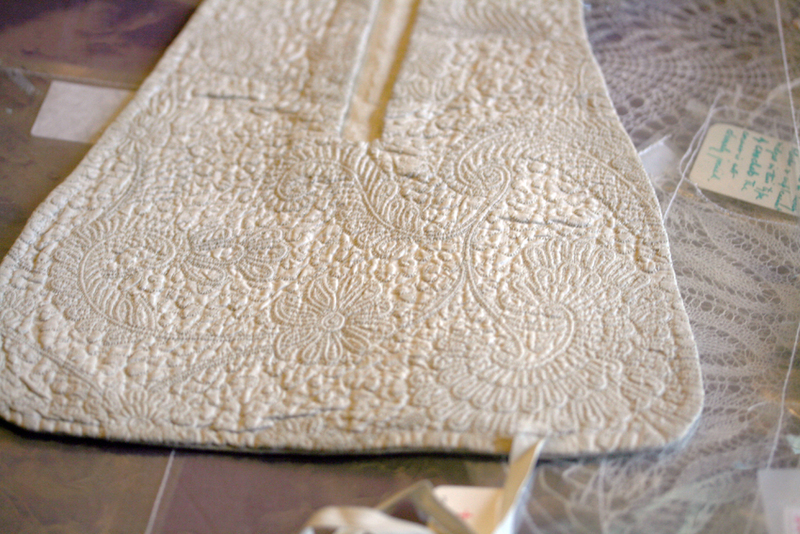 You can request items to be brought out for inspection, and I’m interested in corded quilting, so it was fascinating to see the example you were shown. I wonder whether you have shown us the item which really inspired you, or if you will reveal it as a surprise later. You are such a great teacher Kate. I so enjoy reading and learning from your posts. Gawthorpe Hall sounds like an interesting place. 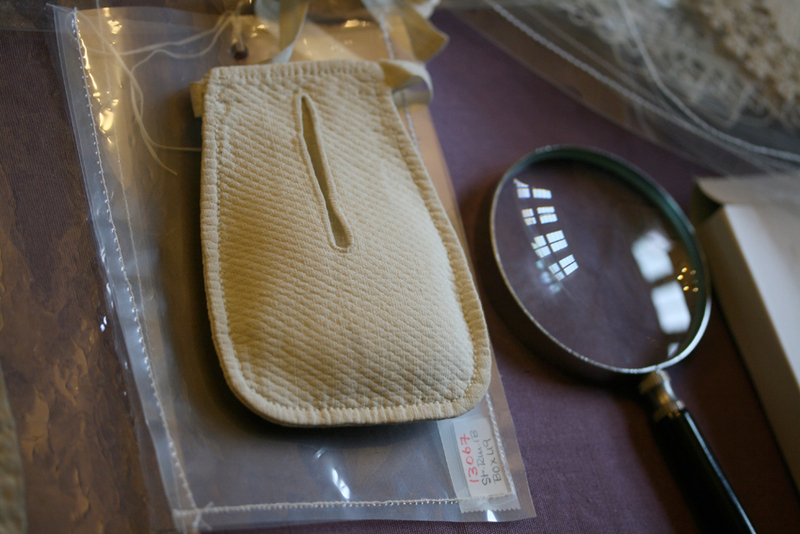 Reading the history of pockets in clothing makes one want to bring them back into fashion. Now I have to order the recommended book from the library to read further. As always thank you for work. Enjoy! Like a kid in a candy shop! How beautifully amazing to be so close to such an important collection. What were the pockets for? Were they external pieces to be attached to other clothing? 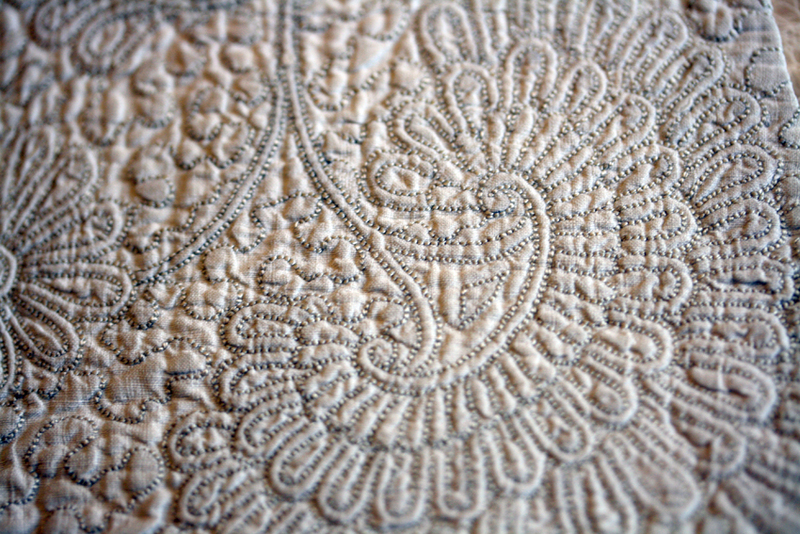 I so love the embroidery….sigh. I visited the Textile Museum in Toronto last Christmas and found it fascinating! So many people take for granted the things which keep us dry and warm, not to mention the beauty of looking at some such pieces. Gawthorpe will be another place on my bucket list….thanks for this beautiful post! Kate, make a pocket pattern? Please? Working women need them. I need my phone, my security key card, bus pass, a it of cash for coffee, pen and index cards and a place for my current sock or quilt square. Thank you. You inspire me so. Your posts are happiness making. What a great opportunity! Many of pieces show cased are beyond fabulous. I have never seen the “pockets” before and so many are beautiful wrought; they remind me of the miser’s purses that I find so intriguing. Kate, thank you so much for all the info about Gawthorpe, and especially the pictures. All so inspiring. I shall do my utmost to arrange a visit there while I am living on this side of the world it looks fascinating. Seems that next Spring would be a great time. Bon courage with your design; it will be wonderful to see what you and your fellow designers come up with. I can’t wait. 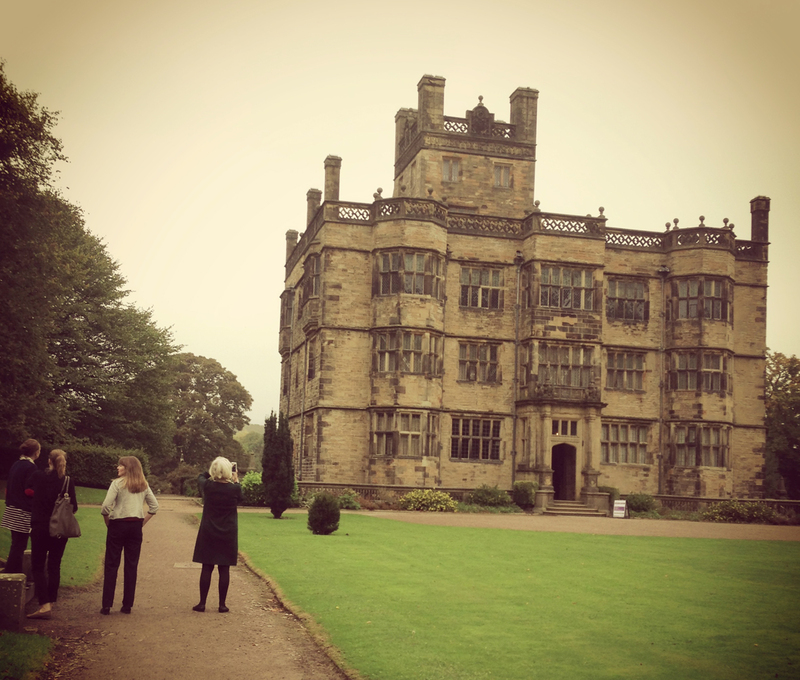 I love Gawthorpe Hall, not least for its Bronte and Gaskell connections, and have been there many times and I am so jealous of you ! Fancy having access to the collection ! and being allowed to touch things ! that embroidery is still so bright and new looking , the quilted pocket with its tiny stitching is exquisite and both look unused ? Several years ago they put on an exhibition of samplers at the Haworth art gallery in Accrington where they have a huge collection of Tiffany glass too and I did enjoy that, but it was all behind glass . You must have had a lovely time with the other designers and I look forward to seeing the results. Oh my goodness what an amazing experience and I can not wait to see what you design. What an amazing and inspirational trip! I am inspired and I didn’t even go! Thank you for sharing your experience. Oh my!! Thank you for the wonderful and inspiring post. Gawthorpe has gone straight to the head of the list of places to visit when we come to Britain. Those pockets…I can see why you love them so. Hmmm my mind is spinning. I look forward greatly to see what all of you design. I like how they called you Designer Royalty! Like Downton Abbey without the fluff!What a fantastic learning experience. And that coverlet/blanket. Stunning! We will have to include this as a stop when we do LEJOG. How satisfying to have so many of the things that give you pleasure in one place, with tea and cake thrown in to the mix, and excellent company. This will have to be on my itinerary when I get round to making the Up North road trip I dream of. Gawthorpe Hall itself and this wonderful textile collection are little gems often overlooked, so thank you for being part of raising the profile of this fascinating place. I can’t wait to see the new designs. Oh my gosh what a wonderful treat for you all and thanks for sharing! Absolutely amazing! So fabulously awesome. I feel like a teenager talking like this! Cannot thank you enough for sharing this treasure. What an amazing experience that must have been, Kate. Kent to Lancashire is a big old hike but I am determined to make it some how as I would dearly love to see that collection. The quality and intricacy of the work is fantastic. I sometimes think that in this busy world we live in today, we have lost the ability to produce such beauty to some degree. Sounds like a day just this side of heaven…glad you get to have many like this for a variety of reasons. I am so impressed with the superb quality of the work. Just imagine how long it would take to perfect stitches like those shown here. Can’t wait to see the results this spring. You are indeed fortunate to live in a place with access to such a rich textile history and so many dedicated people, including the Arts Council. So often textiles are not seen as important as other artifacts, I think because they are viewed as “women’s work”. 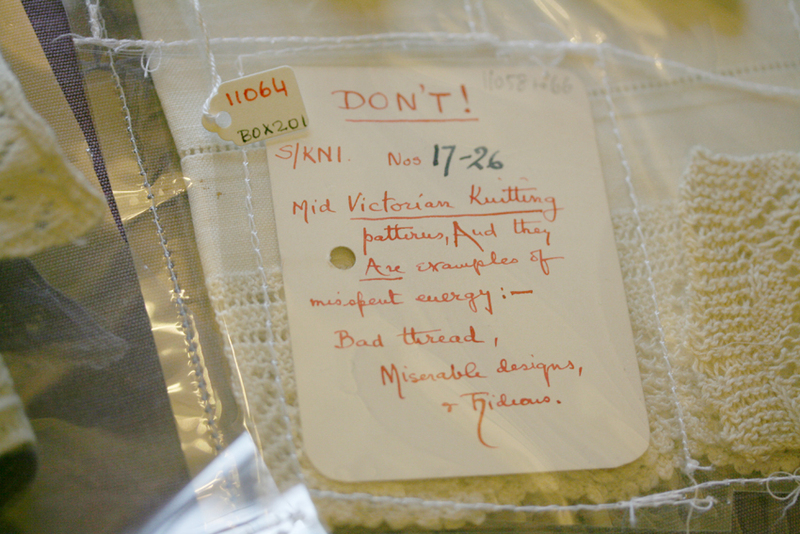 I love the handwritten comment about Victorian “misspent energy”, though. Fabulous–thanks so much for sharing! Lovely post… I want to go there too! 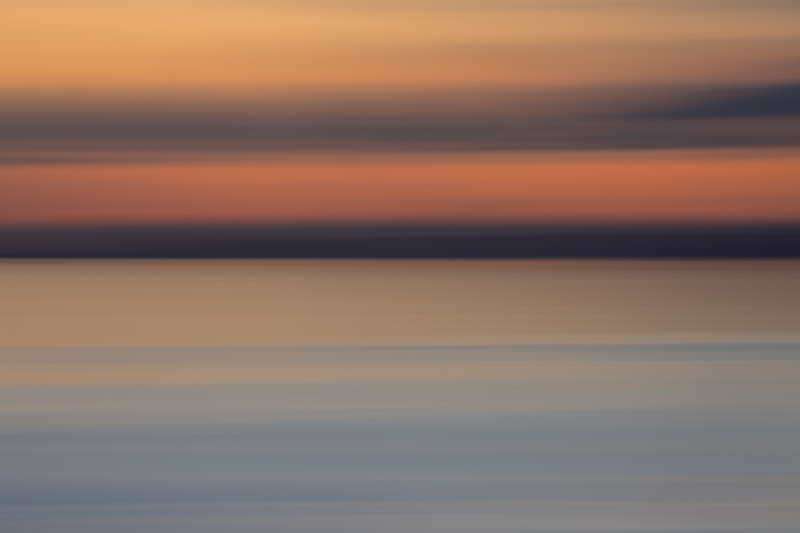 Ohhhh….. how exquisite. Thank you. Kate, what an awesome post!! I too am gobsmacked by the beauty of the few things shown here! I can just imagine seeing the collection on display. You are truly blessed to be able to be a part of something so historic! I am extremely curious about the pockets. Can you explain how they were used? They are amazingly beautiful but I don’t know the purpose of the pockets. I would appreciate this knowledge. Thank you. I think we should reintroduce them! Thank you so much for your quick reply! How very interesting and as soon as I saw the post, I remembered it :) I can’t believe I am conversing with you in Scotland. It is kind of surreal! I have been there and LOVED every minute of it. We visited Edinburgh and the Isle of Skye where a kind gentleman met us and offered us some tea and scotch and a tour of his home AND a bed for the night!!! What a lovely place. I want to return. Anyway, I will be reading that article you linked to on the pockets and I totally agree with you about the return of pockets (along with SKIRTS for women). I love the thought of the pocket being an analogy for their virtue; I think the skirt is also. I wear skirts on Sunday but would love to wear them all the time. Well, thank you again, and it was very nice meeting you in e-person! How fantastic for you and the other creative ladies! Looking forward to seeing what you all come up with in the Spring! Lovely! I often read your posts and find myself wishing I were there with you in the beautiful countryside. The work is exquisite, and what a treat to be able to study the items closely. The pockets are my favorite pieces! 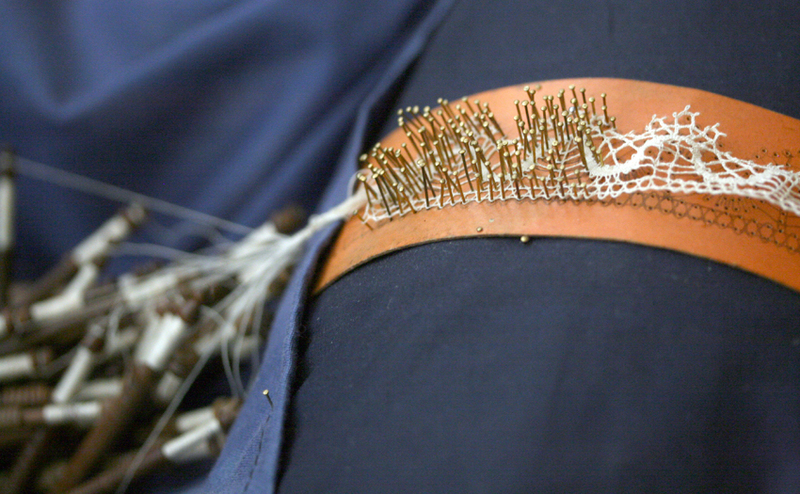 I cannot wait to see the designs inspired by the needlework. Oh Kate, how grand! That is a place I could spend hours and hours in, just breathing in the creativity and being awed by the history. I love the pockets too! Imagine what fun it would be to walk about with such an accessory. :) What a lovely place to visit. Lucky you! Can’t wait to hear how the collections inspire your pattern! What beautiful work and what a fabulous opportunity. Thank you for bringing it to our attention. What an absolute delight to read your post this morning! I have to say, I’m quite envious of you all to be in such a place filled with such beauty. Every photo better than the one before. I wished it hadn’t ended. Thank you so much for sharing and how lucky we are that all that gorgeous work has been preserved. Wow! What an incredible opportunity for you. Thank you, Kate, for sharing your day with us and I can’t wait to see what projects come from this visit.